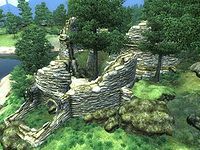 Fort Aurus is a small fort northeast of Bravil, across the Niben Bay, containing conjurers (quest-related). It contains only one zone, Fort Aurus. 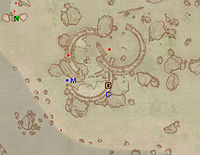 This location's map marker (M on map) is named Fort Aurus (editor name FortAurusMapMarker). The entrance door is E of the marker, 80 feet away. Fort Aurus is a fairly short dungeon with a good amount of loot and little opposition. Your goal should be to reach the wooden chest at W as it contains some rare Shadowbanish Wine. Begin by proceeding through a short tunnel until you reach the first chamber; loot the locked minor loot chest and take care of the nearby foe. After continuing forward, you will be presented with a choice to head either right or left. 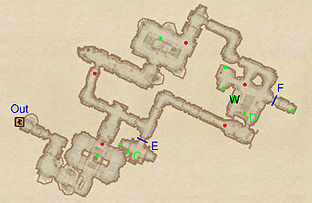 Heading right will get you to the last room slightly faster, but there is no major difference with either path. If you choose to make a right turn, you will quickly see a locked gate at E with some food at C and some potions in a chest on the other side of the gate. You will meet a foe shortly before reaching the door to the final room. 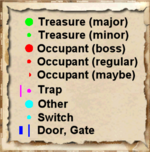 If you choose to go left, you will be presented with a path containing two foes and a locked minor loot chest near some alchemy equipment. Once you make it to the last chamber, take out the Conjurer and loot the Shadowbanish Wine from the wooden chest at W. You will also find some alchemy equipment at D and two chests in the western part of the room. Loot the chest behind the locked gate at F and make your way back to the entrance to leave through door Out. It is advisable to leave going through the path you did not use to reach the final room if you do not mind fighting a few more foes. This will allow you to obtain all the loot in the fort before leaving. Esta página foi modificada pela última vez à(s) 21h31min de 9 de junho de 2014.